Beautiful, lush, colorful and long-lasting hydrangeas have only recently become a standard landscape plant. Once considered old-fashioned, this shrub is among the many Victorian favorites that have made a comeback in the American garden. We especially love them here in East Tennessee, where they are winter hardy and nearly everybody’s grandmother had them growing somewhere in their yard. I have extensive knowledge of how hardy hydrangeas are. Twelve years ago, I asked my children to each give me a hydrangea for Mother’s Day. I had already picked out the plants, and all they had to do was cough up the money to their father. I planted the five hydrangeas close to the entrance of our farm under a dogwood. You have seen the pictures in magazines—large fluffy blooms, gorgeous color and a heavenly scent. This display was going to wow my visitors. Being a new gardener and not researching the plants enough, I found myself with constantly wilted plants, and I had no easy means of getting water to the thirsty, spindly little shrubs. I hoped that this wilting was due to the new plants not being established. The next year, I had the same disappointing performance—weeping foliage and no blooms. The third year, I dug up the plants, brought them to the house and planted them again, this time outside the garden room where water was abundant and I saw them every day. The fourth year, I had only foliage again, but not as much wilting thanks to the water. Looking after them daily became a chore when winter came since they are deciduous; I was gazing at little bare sticks. I then made a terrible mistake and pruned them back severely. This was a sure way not to get any blooms the next summer, since hydrangeas bloom on old wood. Fast forward ten years, lots of water and no pruning, and my hydrangeas are finally fabulous, magazine-quality beauties. 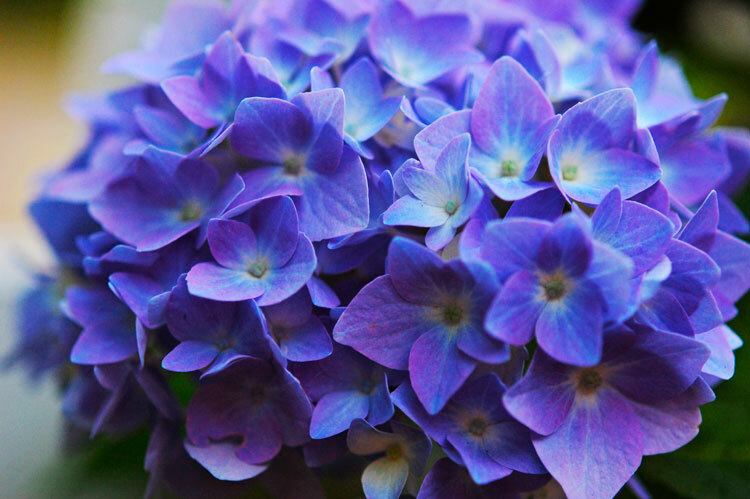 The color of the hydrangea is affected by the soil. If you bought your plant or received it as a gift in full bloom and then the next year, your plant had a weaker color or faded appearance, you need to amend the soil. Flower color depends to a large extent on soil pH. Acidic soils (pH 5.0 to 5.5) yield blue to purple flowers, while more alkaline soils (pH 6.5 to 7.5) yield pink to red ones. Some cultivars are more affected by pH than others, but white flowers (my favorite) are not affected by pH at all. Lime is used to raise the soil pH (make it less acidic), and aluminum sulfate is used to lower it (make it more acidic). Any changes you make in the soil’s pH should be done gradually over several seasons. If you have strongly acidic soil and want to grow pink hydrangeas, growing them in containers would be your best option, as they are a great container plant. Even with our increasingly warm winters, we still need to remember that they like partial shade and well-drained soil (late, hot afternoon sun really makes them droop). Make sure they are planted in an area where water is an easy commodity. Without rain, I am watering mine every other day with a soaker hose. Two native hydrangeas are Oakleaf and Annabelle. Being native to our area, they flourish with less effort than Lacecaps or Mopheads. Oakleaf blooms start out green and turn white as they mature, and they get to be as much as eighteen inches overall. Their name comes from the beautiful shape of their leaves, which look like an Oak tree leaf. Their handsome foliage turns a brilliant red and orange-brown in the Fall. Annabelle has numerous flowers and blooms that are a pure white. This native can be pruned and returns to bloom in the same season. Neither Annabelle nor Oakleaf has their color affected by soil pH, so enjoy them in their natural shades of white. If we have a surprise frost late in the spring season, these natives will still perform, whereas you may lose all of your Mophead blooms. Hydrangea blooms are easy to dry and use in your home throughout the seasons. If you like the Victorian look, just let them dry in a vase. Cut the flowers early in the day when in full bloom, and let them stand in two to three inches of water (do not replenish the water) until they are dry. This gives a fuller, more natural form. You can also hang the fresh flowers upside down in a dark, dry space, but the heads will tend to wilt or collapse. These dried flowers can be used in wreaths, dried arrangements or as holiday tree decorations. If they are allowed to dry naturally on the plant in the garden, they have a natural bronze color, and the heads will usually last until after Christmas. Southern Living had an article in June 2001 on propagating hydrangeas. The technique is extremely simple. Step 1: Take eight- to twelve-inch tip cuttings in early summer and strip off the lowest pair of leaves. Step 2: Wet the cut ends and dip them in rooting powder. Step 3: Stick each cutting into a container of moist potting soil. Keep the soil moist and in the shade. The cutting should root in six to eight weeks. This is an easy way to increase your plants. Water is the key item in rooting and growing hydrangeas. I have an obsession with hydrangeas. Currently, I have fifteen Oakleaf standing over eight feet tall, eight Lacecaps, twelve Annabelle and twenty various Mopheads, with colors ranging from white to various shades of pink and blue. I have a soaker hose running through the beds. I started with five hydrangeas fifteen years ago, and today I have over sixty. I did tell you that they are easy to root. Located on Main Street, in the older part of Calhoun, Tennessee, is the Taylor – Maddox home place. The unique architectural elements, reminiscent of a country farmhouse, are subtle reminders of a by-gone era. Perhaps the oldest surviving building in Calhoun, locals refer to it as their “witness house”, a structure that has seen and experienced much of the early history of Calhoun. Recently the Mike Myers family became the 5th and 6th generations of the Taylor-Maddox families to return to their roots and take up residence in this Calhoun landmark. Mike’s great-grandparents, Dr. and Mrs. H.F. Taylor purchased the house in the early 1900’s and brought their family there. A great-great-great aunt also occupied the house at one time. Mike’s grandmother, Mrs. Fannie Taylor Maddox grew up in the house, as well as Mike’s mother, Ruth Anne Maddox Myers. Mike, his wife Sandy, and daughter Julie are now experiencing the memories and history of the house as it has become their home. The house sits on Lot 46 of the original Cherokee reservation granted to John Walker by the Treaty and Hiwassee Purchase of 1819. The town of Calhoun grew up around it with early merchants, settlers, and military personnel from Fort Cass across the river. One of the earliest records indicates that I.H. Bond, an early merchant, built a small home on the lot, the beginning structure that later became the Taylor-Maddox house. Descendants of the Taylor family recounted that the Bond house was assimilated into a larger structure as new owners enlarged the home over the years. Throughout its existence, the house has witnessed significant events in the history of Calhoun. On the night of April 29, 1909 most of the business district of Calhoun was destroyed by a fast moving fire. The Taylor-Maddox house was spared, but sat just a few feet from many of the buildings destroyed. In 1920 the house saw the first section of concrete highway appear in Tennessee, as Main Street was paved with this new material. This roadway still exists today and is part of the National Historic Highway designation and was also the route 3,000 North Carolina Cherokees traveled on the Trail of Tears in 1838. Before TVA began their flood control of the Hiwassee River, residents of the house frequently watched from their porch as flood waters engulfed the lower sections of Calhoun. 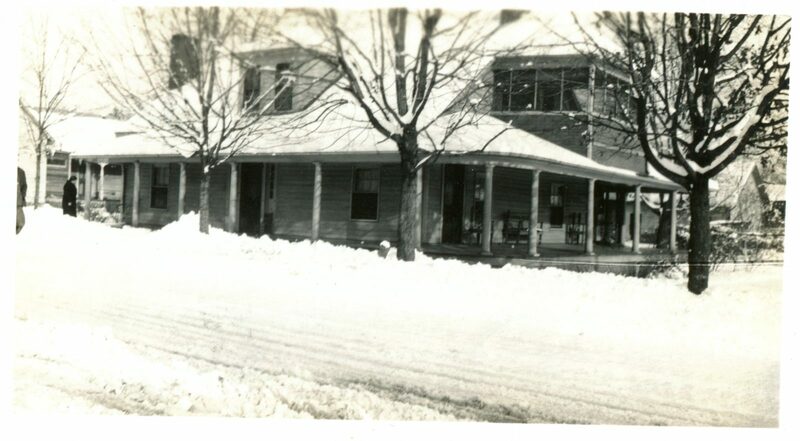 In 1935, a destructive tornado came up Main Street, just feet from the house. Although damage in Calhoun was extensive, the home was spared. Bess Taylor Cofer, (a teacher, now deceased) grew up in the house and told her students how she ran outside as the tornado passed and saw a large funnel of fire at the north end of the street. Mike’s great grandfather, Dr. H.F. Taylor, had his doctor’s office and practice on the site and for decades provided medical services to thousands of people throughout the area. In August 1946 the town honored him by proclaiming “Dr. Taylor Day” with a huge celebration near the old school. During his career, Dr. Taylor delivered 9,000 babies, and on this day hundreds returned as adults to honor him. Perhaps the most historical event the house has endured was a disastrous fire at the structure itself in January 1994. On that cold winter day, Ms. Fannie Taylor Maddox, then in her 80’s and resident at the time, built a fire in the dining room fireplace and returned to her living room. Speculation is that an ember from the fireplace started the blaze which traveled to the attic. Employees of Padgett Furniture Co. down the street noticed smoke coming from the house and rushed to the scene. One employee, Terry McGuire, rushed into the burning structure and found Ms. Maddox, disoriented and trapped in the rear of the house. He quickly picked her up and started carrying her towards an exit when an explosion knocked them to the floor. He crawled on his back with Ms. Maddox on top of him until they reached the door to the porch. Once outside he collapsed and was taken to a local hospital. Ms. Maddox was only slightly injured. By now, the dining room, kitchen and upstairs of the entire structure were engulfed in flames. Local residents, employees of Padgett Manufacturing and members of the Calhoun Fire Department entered the burning structure and were able to save many valuable family heirlooms and antiques. Firemen were able to stop the fire before it consumed the entire house. Calhoun’s witness house could have vanished at that time, but Mrs. Maddox chose to rebuild the destroyed sections of the house and make it appear much the same as it had been before the fire. Six months later, Mrs. Maddox was once again living in the house and its destiny of being a witness house continued. She remained there until her death in 1999. Today, Mike, Sandy and Julie Myers continue to enjoy the large wrap around porch of the home. No longer can they see the many stores, bank, depot, female academy and boarding house across the street. These have vanished though the witness house remains and stands in testament of what once was a thriving community. The Myers family are the new caretakers of this historic structure. Inside, several of the rooms remain the same as 150 years ago. Some still bear the scars of the fire in 1994 while others destroyed have been rebuilt. History abounds, not just within the walls, but the entire vicinity of the house. The Myers family, representing the fifth and sixth generation family members now continue to watch events unfold in the town as the witness house gathers more memories for future generations. Spring is, by far, one of my favorite seasons. I personally think it’s the most romantic…with trees and flowers in bloom and warm weather settling in after a cold winter. Spring holds a new promise of fresh experiences. In a sauté pan place the clarified butter and the fine diced red onion. Over high heat, Sautee the onion until it is translucent. Deglaze with red wine vinegar, add sugar and allow reducing over medium heat until syrup is made. 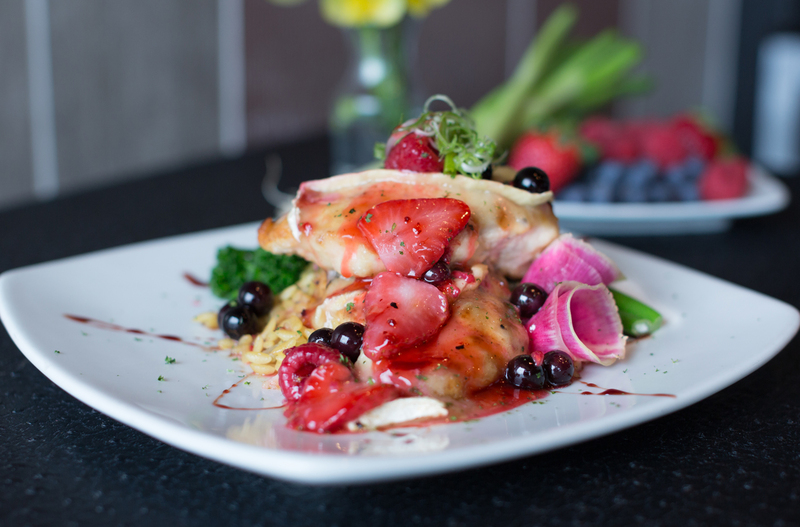 Place the raspberries, strawberries and blue berries in a metal bowl, pour the hot syrup over the fresh fruit allowing them to marinate in the syrup. Serve at room temperature. We hope you have a fantastic spring with your family and friends. Tennesseans love Peyton Manning. That’s a given. But did you know that you can cuddle with and feed Peyton Manning — the turkey, not the human — in Knoxville any Saturday that you want? Rick Springfield, the rooster, lives next door to Peyton and he also loves to snuggle with people. Peyton and Rick are just two of the fortunate residents living at the Gentle Barn Tennessee. If birds are not your petting preference, you may also like to meet Dudley the cow, who lost a foot when he was a baby and now wears a prosthetic leg. 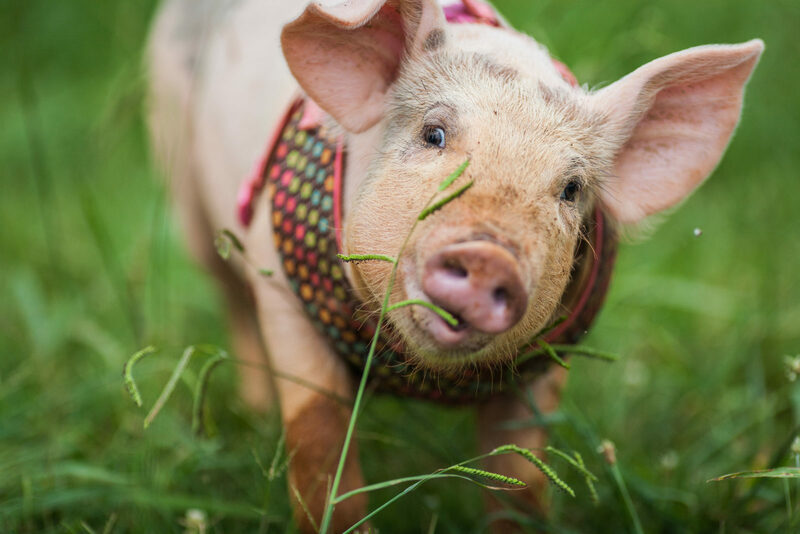 Another lovable creature living at the Gentle Barn Tennessee is Lillie the pig, who was lethargic and unable to move when rescued from the back of a truck full of pigs. Perhaps you are an avid animal lover who is looking to contribute your time to a cause. If that’s the case, you may be a perfect candidate to become a Gentle Barn volunteer. In Knoxville since June 2015, the Gentle Barn Tennessee rehabilitates abused farm animals and connects their stories of healing and survival with the personal experiences of at-risk and special-needs children who have suffered physical, mental or emotional trauma. These animals have had negative experiences in life, but their willingness to trust humans again allows them to live out their lives in the care and comfort of a loving environment. It’s precisely the animals’ willingness to trust humans again that helps children who have undergone abuse understand that healing is possible. While the current West Knoxville location is excellent, they have outgrown it. For that reason, they will soon launch a capital campaign to raise funds. “We love our current location but are eager to find our forever home to grow roots and continue the life-changing work in our community for abused animals, at-risk youth and disabled people,” said Knoxville native Becky Mink, advisory council chairperson for the Gentle Barn Tennessee. The Gentle Barn Tennessee, a 501 (c) (3) nonprofit organization, operates from donations. The organization hosts groups of children on weekdays and the public is welcome on Saturdays from 11 a.m. to 1 p.m. A donation of $20 per adult and $10 per child for admission also includes lunch. For tickets and additional information, please visit GentleBarn.org/Tennessee. Springtime brings warm weather, blooming trees – and allergies. In fact, spring can be one of the worst seasons for allergy sufferers. Pollen appears in the air; the house seems to contain more dust than ever; and every rain puts a barrage of mold in the air! Normally the immune system protects our bodies from invading organisms like bacteria and viruses. In people with allergies, the immune system mistakes an otherwise harmless substance (like pollen) as an invader. This leads to production of antibodies that signal certain cells in the body to release histamine and other chemicals, leading to an allergic reaction. Allergens such as pollen from trees and grasses, dust mite particles, pet dander and mold spores often enter our bodies by inhalation. If you have allergies to any these particles, your immune system reacts with symptoms of coughing, runny nose, congestion and sneezing. You may also experience severe fatigue, sinus headaches and difficulty sleeping. Avoidance of allergens would be wonderful, but it’s not possible. Several medications are available to treat allergic symptoms, but it can be difficult to know which one is right for you. Some anti-histamines can cause drowsiness and an increase in your blood pressure, not to mention that many people who rely on them find that they stop working after long-term use. If you’re tired of simply covering up the symptoms of your allergies, it may be time to try immunotherapy. 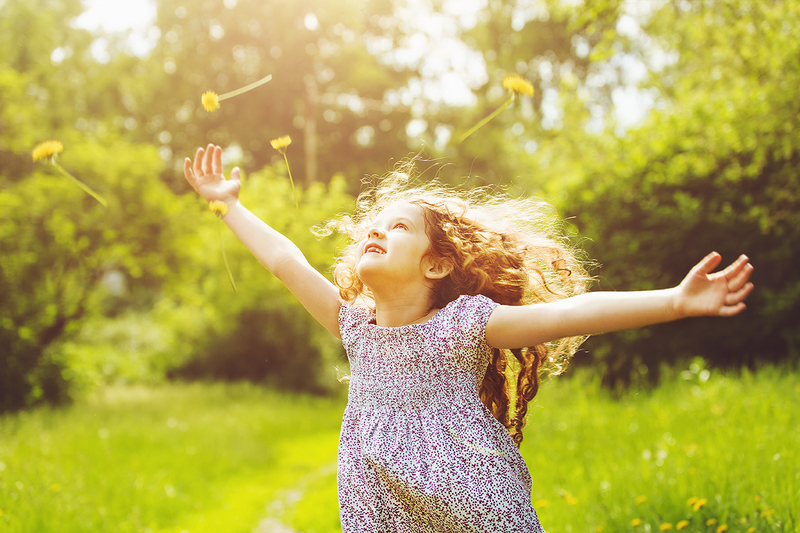 Immunotherapy is a natural way to treat allergies. It begins with a build-up phase where you receive increasing doses of allergen over time, leading to the maintenance or “goal” dose. It allows your body to build resistance to the specific allergens that are triggering your reactions, and the sooner you start immunotherapy, the sooner you will experience relief. Before beginning any treatment plan, it’s important to be seen by a board certified allergist. Allergists have years of advanced training and experience to properly diagnose your specific allergens and recommend a custom path to relief. To find your way to allergic relief, schedule an appointment at The Allergy, Asthma & Sinus Center today!